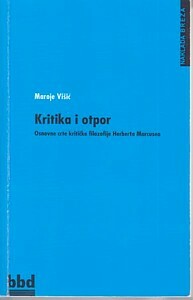 Maroje Višić, Kritika i otpor: Osnovne crte kritičke filozofije Herberta Marcusea (Zagreb : Naklada Breza, 2017), 267 pages. The purpose of this work is to examine the intellectual legacy of Herbert Marcuse, a once exceptionally influential, and today largely forgotten critical-utopian thinker, fifty years after the first publication of One-Dimensional Man. Marcuse's entire philosophy and genealogy of his thoughts are depicted, with an emphasis on early works in which he established his position, as well as Marcuse's most significant critics, such as MacInytre and Schoolman. In conclusion, the author contemplates the actuality and applicability of Marcuse's philosophy in today's social situation.